Posted on August 18, 2017 at 1:45 pm. Every month the editorial team at TopOnlineCasinoSites round-up our favourite online and mobile casinos to take a quick look at their current sign up bonuses, real money game releases and promotions and why new players should consider scoping out the new blood for some fantastic welcome package offers. Two relatively new online casinos have made the cut for our August 2017 wrap-up, in part thanks to their continuing game library expansion and whopping welcome bonuses that blow the competition out of the water in terms of value – check them out, along with links to full reviews below. Exclusions: Unfortunately, you cannot play or sign-up at Agent Spinner if you are from the following countries: United States of America (and its dependencies, military bases and territories including but not limited to American Samoa, Guam, Marshall Islands, Northern Mariana Islands, Puerto Rico, and Virgin Islands), Australia, France, Greece, Estonia, Belgium, Spain, Italy, South Africa, Denmark, Turkey, Hong Kong, Afghanistan, Ethiopia, Iran, Iraq, Jordan, Kuwait, Pakistan, Syria, Nigeria, Singapore, Slovenia, Romania, Bulgaria, Portugal, Philippines, Poland, Israel, India or Yemen. Agent Spinner is a completely new online casino which first launched halfway through 2017 and has since captured our full attention for its impressive games variety, hassle-free deposits, prompt payouts and user-friendly desktop and mobile interface which makes jumping into the next game easy. Agent Spinner is a no-download casino, meaning it requires no installation of special software to play. While the site is still evidently growing and the interface is basic compared to the existing competition, we found the very straight-forward ‘jump in and play’ direction (especially on their mobile version) quite appealing. Everything loads fast and feels more responsive than some older casinos we frequent. 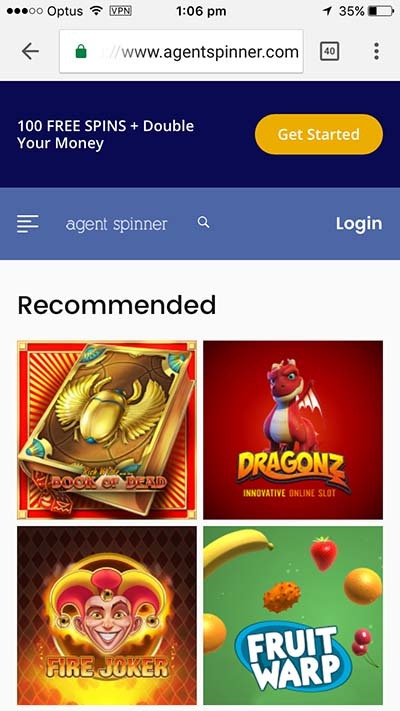 Agent Spinner already boasts over 800 real money slots and table games from some of the world’s best gaming software providers in the business such as BetSoft, Elk Studios, Microgaming and Net Entertainment along with slots from half-a-dozen smaller niche studios to round out the catalogue for every type of player’s current mood or preference. The sheer number of games on offer definitely makes for great first impressions, considering many other sites which debuted this year have launched with far less to entice customers away from the big names. 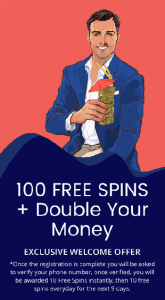 The current 100 free spins upon sign up and the matched deposit bonus is nice, but we do hope to see more generous offers thrown our way from this promising new casino in the weeks to come. Read the official Agent Spinner Casino review for more information on current bonuses, promotions, games and licensing. Exclusions: Ignition does not specify specific exclusions, but is currently only known to cater to Australia and the United States. 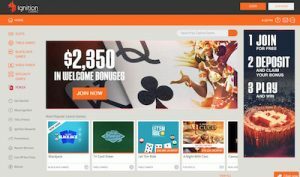 Ignition Casino was technically founded in 2016 but it has only recently opened its doors to Australian players, with its main focus on servicing USA players with the very best online poker, slots and table games software. This year the site has really hit its stride with some incredibly generous welcome bonus offers, with a maximum total of $4,350 theoretically up for grabs if you’re the type of player that loves to take full advantage of what newer online casinos have to offer. Ignition is an instant-play online casino like Agent Spinner and thus requires no downloading of special software – however, its poker section does require you to download its poker client (desktop only). This is a dedicated online poker platform that was once part of the Bovada Poker Network, which is one of the largest American poker networks in the world and continues to be to this day. Along with 150 of the best real money slots and table games from Bodog Proprietary, Real Time Gaming and Rival Gaming, Ignition has a stellar selection of gaming experiences for United States players in particular, who don’t get many other quality options due to their strict online gambling laws. Ignition’s current welcome bonuses are arguably the best value on the market for new sign-ups. You can claim 100% up to $1,000 in casino bonuses, and a further 100% up to $1,350 while playing Ignition Poker and raking up additional reward points which can be redeemed for further cash. Best of all, if you are a new player who prefers depositing with Bitcoin, you can claim a once-off 200% up to $2,000 Bitcoin welcome bonus on your first cryptocurrency deposit with Ignition. Read the official Ignition Casino review for more information on current bonuses, promotions, games and licensing.